Merry Christmas from Atari 2600 Land! I know I should do an update soon, but I don't know what to do. Death Trap added to my personal 2600 collection. I'm now at 319 games. I'm still alive, but no update as of now. Star Strike added, total is now 318. I'm still here, although with no update to the site as of now. Now at 317 with the addition of Room of Doom. Check out a screen from my latest work: Arboretum Ape, a DK3 clone. Added two new games to the 32k+ Game article. I'm still alive, though. Doesn't that count for something? Added Spy Hunter. Now I'm at 316. Added Guardian. Now have a total of 315. AA member "RevEng" has built and released a kernel that allows cool-looking title screens, and "jwierer" has made a cool bmp-to-asm code converter that allows bitmap pictures to be converted to code that you can then copy and paste into the asm file that RevEng made. You can follow all the progress he made, as well as get both things I've mentioned here. 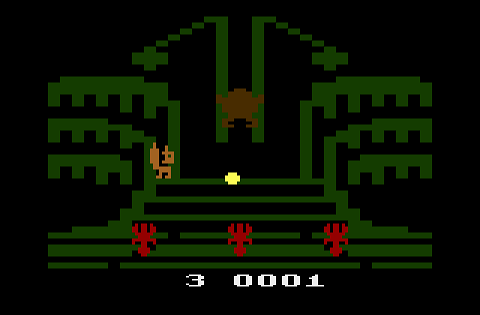 I've updated my personal 2600 collection! It's been a while, but I've updated my personal 2600 collection! Time sure does have a way of escaping. Nothing much except for the soon-to-be released Alien Greed 3. I've been busy working on Terrance & Phillip 2. Nothing much going on in the world of Atari except a guy on the AtariAge forums sold a boxed copy of Air Raid for a staggering 5-figure amount! I'm still here, just no updates for now. 4/1/10 Happy April Fools' Day! Today is the day to take everything on the internet with several grains of salt, not just one as usual. With the addition of I Want My Mommy, I'm now at 308 games. Added a game in the 32k games article (my 2600tris). I've also put up a new version of TI-Tac-Toe for the TI83+/84+, so check it out if you have one. Wow! I made a new article, more like a list, a list of 2k games. Check it out in the Articles section. It's been that long since I updated? Oh, well, nothing new, just an update saying I'm still here. Now at 305 VCS games! OK, people, I do NOT want advertisments on this website, so PLEASE quit bugging me about them. If I get any e-mails about wanting to buy ads on this website, they will be ignored! You have been warned. Here's something that's not Atari 2600 related that I did: A TI-83+ BASIC game called "Plussy." It also plays on a TI-84+, so if you have a TI-83 or 84, please download it and tell me what you think. There's a page for the game here. I'm back working on 2600tris. You can find it here. Updated the out-of-date My Personal 2600 Collection. Just dropped in to say hi, and happy 4th anniversary at atari2600land.com! I'm working on 2600tris again. Sorry for not updating this sooner, but I just forgot about the site and its 4th birthday (1/2/10). I'll be updating my collection pretty soon, it's been a long time for that, too.